Gazebos have a romantic, old-world appeal and is often surrounded by natural features such as ponds, manicured gardens and trees. When planning a wedding, think of the gazebo as the stage where the couple can say their vows, share their first married kiss and pose for pictures. Look for gazebos with the right size and surroundings, and don't worry if one doesn't look exactly right at first. Any gazebo can be draped and decorated to tie in with the rest of the wedding. Start at the bottom of the gazebo. Cut pieces of fabric to the length of the columns. Center the pieces of fabric at each column and secure them with staples along the inside edge of the gazebo roof. Gather the fabric halfway down the column and secure it in place to the column with clear plastic tie. 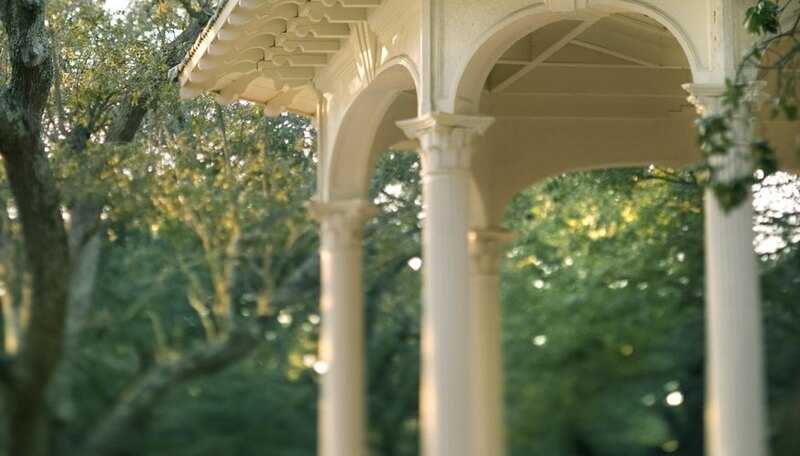 When finished, each column should be framed by a V of draped fabric that hangs from the roof of the gazebo. Cut pieces of ribbon just slightly longer than the circumference of each column. Give the end of each ribbon a small tab of adhesive Velcro. Secure the ribbons around each of the columns to hide the plastic ties. Measure the entire gazebo before buying the materials for draping it. Consider floor to ceiling height, distance between columns, railing height and the full circumference of the structure. Tulle is the most common fabric to drape with, which also means that it's expected. Consider using other fabrics that drape well, such as cotton jersey, chiffon or raw silk. Keep the draping simple and then weave other elements, such as fairy lights or floral garlands, into the base or railing of the gazebo.